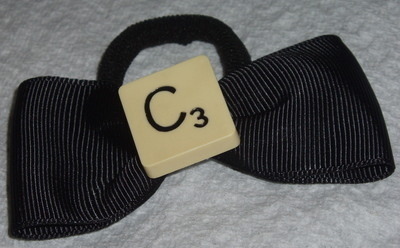 Handmade Scrabble Letter black Pony Tail Bow with elastic band. Choose which initial you want. Super gift for a Scrabble player. You can even add a Swarovski crystal to the ribbon if you like. I recycle Vintage Scrabble letter tiles so you may receive an item made using thin square back black or thick round back black. NB - J's and K's are in very short supply again, so any jewellery with these letters may take up to 10 working days to process and dispatch. Normal dispatch for all other letters about 4 working days.